It goes without saying that a warehouse-sized property with an abundance of concrete probably wouldn't be described as "intimate." 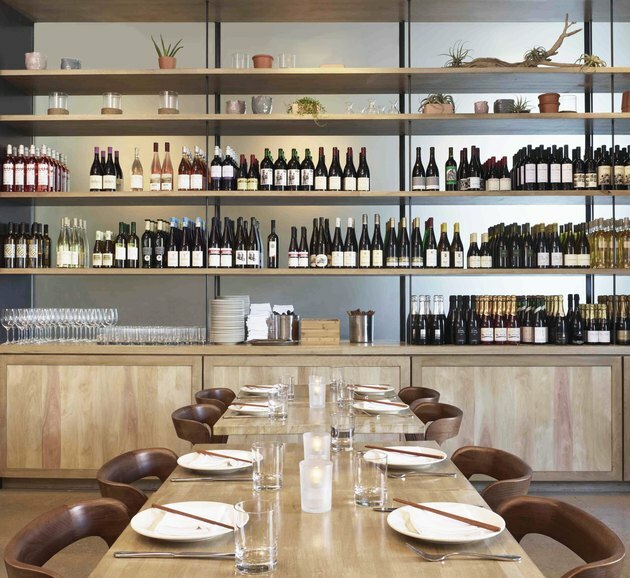 But at Cassia, a Southeast Asian restaurant based in Santa Monica, intimacy is actually achieved with the help of space. The 5,000-square-foot location was designed by Montalba Architects as a series of semi-private rooms that share sleek mid-century and industrial touches. Take, for instance, the two separate bars — yes, one for drinks and another for seafood — that use the height of the walls for dramatic open shelving and oversized windows for large swaths of light. Despite the scale of both options, pendant lights stretch down to just above the marble counters, and plenty of seats invite guests to gather together. Even a long communal table, which gets its lighting from repurposed bird cages, manages to feel like it's inside a home kitchen thanks to an antique steel hood nearby. These details make the restaurant feel cozy, even when it's filled with strangers. 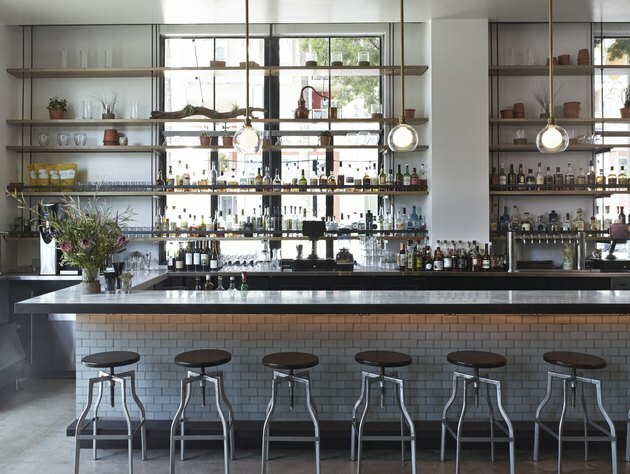 The marble bar features pale blue revival tiles from Mission Tile West, and invites guests to sit on Stockton Bar Stools by Designform Furnishings. Long, open shelves back lit by large picture windows turn glassware into decoration. 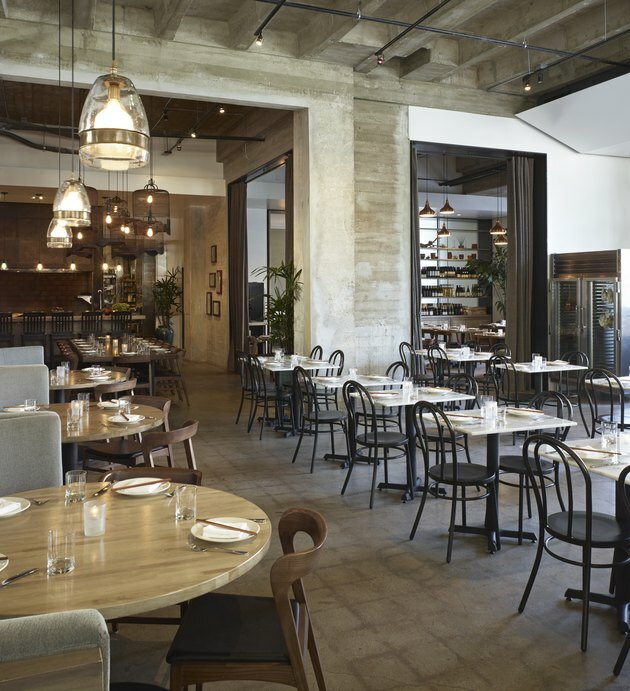 The Italian Calacatta white marble table tops contrast with black bistro-style chairs in the main dining room. 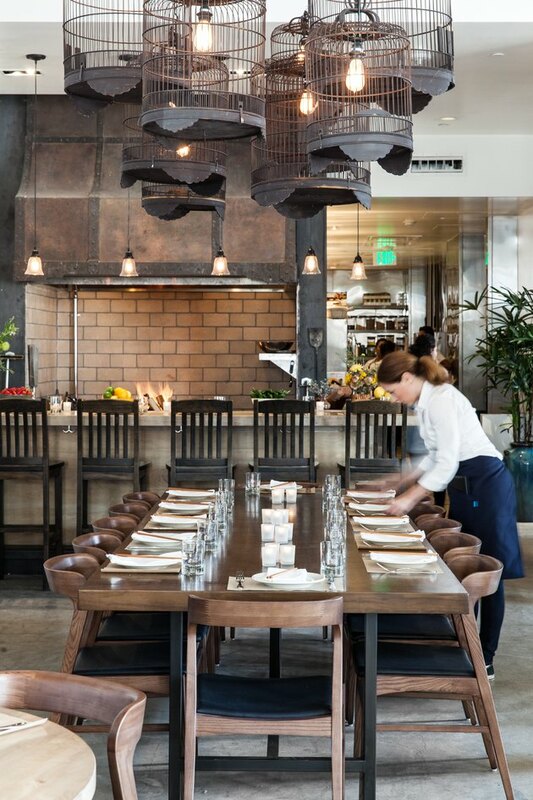 Just off the main dining area is a striking antique steel hood that can be viewed from a rustic communal table. Vintage iron birdcages from Vietnam hang above. 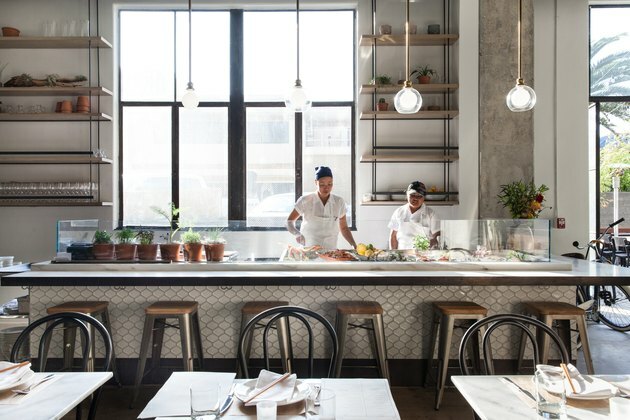 Eggshell honeycomb tiles by Nemo Tile Company surround the seafood bar, while incandescent pendant light fixtures by Lucent Lampworks shine overhead. The wine room exhibits a large selection of bottles on open shelving and bleached maple cabinets. Larsen Arm Chairs by Designform Furnishings and honey-toned tabletops make this private dining area casually elegant. While Cassia's dining area is made up of several semi-private spaces, plants work to bring them together. 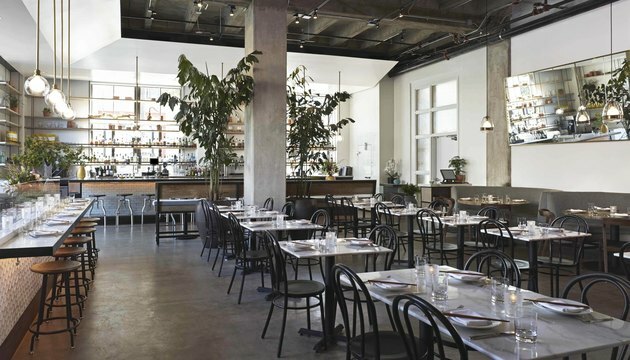 Succulents and herbs adorn the open shelving, and large potted trees give the restaurant color.